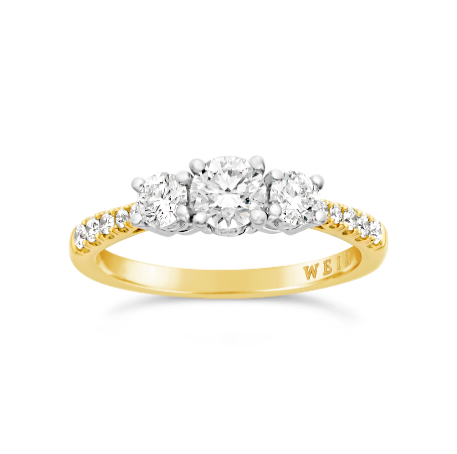 You’ve found your perfect match, now it’s time to find your perfect ring with help from the experts at Weir & Sons. 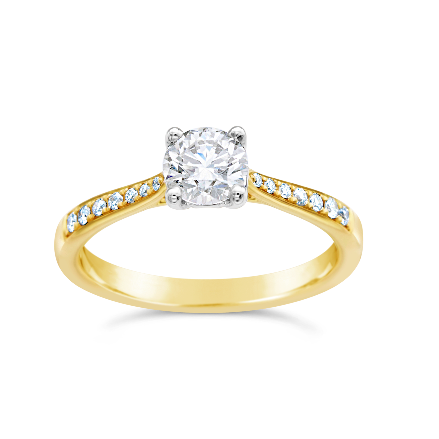 An engagement ring will not only adorn the wearer’s finger for a lifetime, it also carries a huge sentimental value, and choosing the perfect ring requires a lot of consideration. 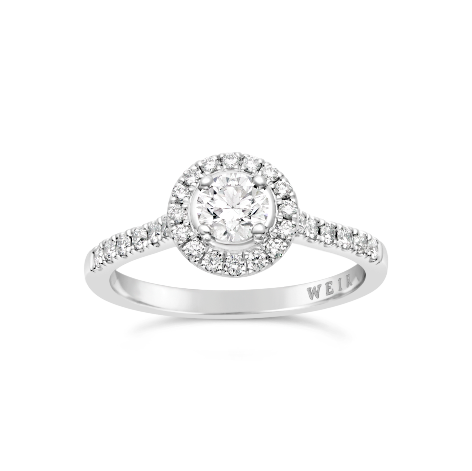 The experts at Weir & Sons are here to help, offering an unparalleled range of engagement rings in both their Grafton Street and Dundrum Town Centre stores to suit every budget and bride-to-be. 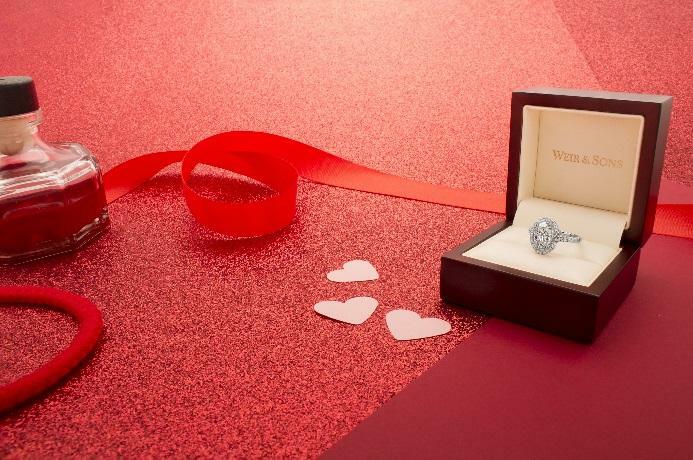 Plus they’ll ensure that choosing your ring is a special and memorable experience, complete with personal attention in a private viewing room and complimentary champagne. With rings ranging from just €850 to blow-the-budget, finding your perfect match couldn’t be easier. 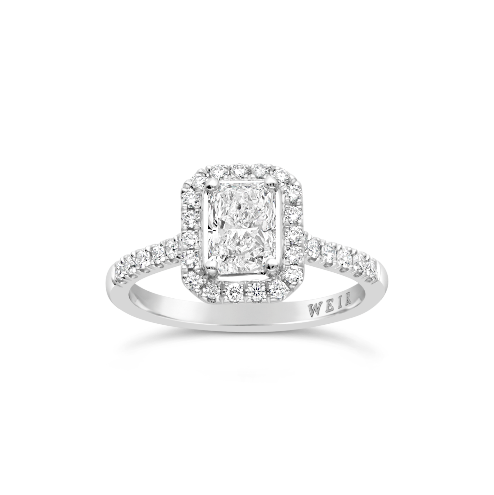 Before you embark on choosing your ring, Weir & Sons has this piece of advice: “While it is very important to consider the 4Cs (carat, clarity, colour and cut) in choosing your ring, I would recommend focusing on the aesthetics first to find the right style, and then comparing the characteristics of the diamond. Current styles in vogue include the Halo, which is a larger centre stone surrounded by a Halo of smaller stones while classics like the Solitaire or the Trilogy are always in fashion, as the proportions tend to suit different shaped hands.” We’ve rounded up just some of the best-loved styles that have just arrived at Weir & Sons. 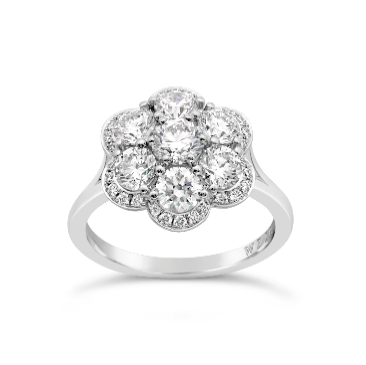 This platinum and diamond ring, €6,170, is designed in a flower cluster style with a centre diamond surrounded by six slightly smaller diamonds with a halo of 30 round brilliant diamonds housing the cluster, making for a sparkle that is truly unique. 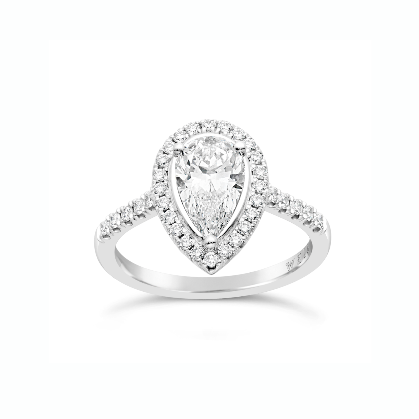 A real statement ring, this platinum pear cut diamond engagement ring, €13,580, comprised of an incredible 1.21ct pear shape diamond set with three platinum claws and housed in a 36 diamond halo surround and diamond set shoulders, is a must-see. 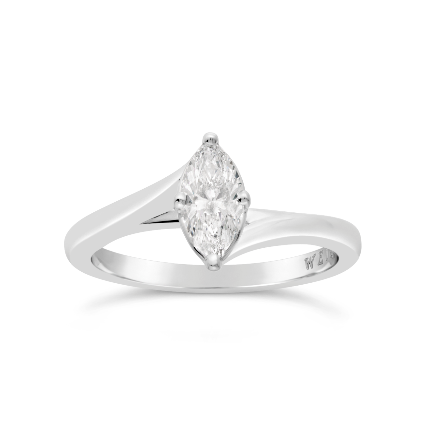 We’re super excited about this elegant platinum Marquise cut diamond engagement ring, €3,520 – the unusual twist platinum band makes it a real standout piece. This diamond solitaire engagement ring, €27,300, houses a 2.01ct round brilliant diamond, G in colour and SI2 in clarity, IGI certified with an excellent cut, in a four claw platinum setting. The centre stone is complemented by six diamonds set along the bane on either side, enhancing the natural beauty of the incredible solitaire. How fabulous is this radiant cut diamond, €8,620, set in a halo surround with diamond set shoulders – truly breathtaking. A modern taken on the classic three stone engagement ring, originally designed to represent the past, present and future of your life’s journey together, we adore this 18k gold ring, €3,130, with a 0.40ct diamond at the centre and two 0.32ct diamonds on either side, complete with scalloped edge and diamond set shoulders. This exquisite diamond ring, €5,760, is set in a diamond set, double split shoulder setting and cast in platinum, set with forty two diamonds. 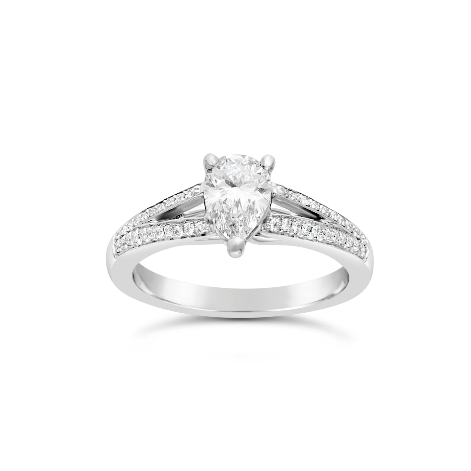 Three platinum claws secure the centre diamond, enhancing its natural sparkle. This platinum and round brilliant Halo engagement ring, €2,760, features twenty eight round brilliant sparkling diamonds including a round brilliant centre stone and a diamond set halo and shoulders. A timeless classic, we love the Henry ring, €6,685, an 18ct gold and platinum diamond ring complete with 14 smaller diamonds in the band. Carat refers to the weight of a diamond – one carat weighs 0.2 grams and is split up into 100 points. 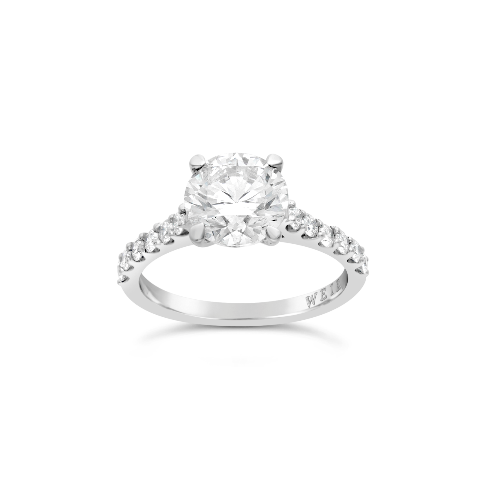 Generally speaking, as larger diamonds are rarer, they are also more expensive. Clarity refers to the presence of inclusions in a diamond. Inclusions are natural identifying characteristics such as minerals or fractures which occur while diamonds are formed in the earth. Colour Diamond colour is all about what you can’t see. Diamonds are valued by how closely they approach colourlessness – the less colour, the higher the value – and are graded on a scale of D (colourless) through to Z (light colour). Weir & Sons focus on colours D, E and F, and rarely go past a G.
Cut refers to the angles and proportions of a diamond, and also its shape, for example round, square, pear or heart shaped. The cut influences how the diamond’s facets interact with light and is the first part of the cert which should be looked at because a badly-cut stone will leak light from underneath. Neville McDowell, Jewellery Manager, and Stevan Whelan, Assistant Jewellery Manager at Weir & Sons, have a combined experience of over 60 years of helping couples choose their perfect ring. Both are available for expert quotes .